During my time with Insight Design, there were many situations where I was overcome with complex problems or seemingly unfixable bugs and needed a way to zone out and relax my brain before it burned out. In these moments of weakness, my best release was to just draw whatever came to mind anywhere I could and focus on the simplicity of the lines and the familiar images. 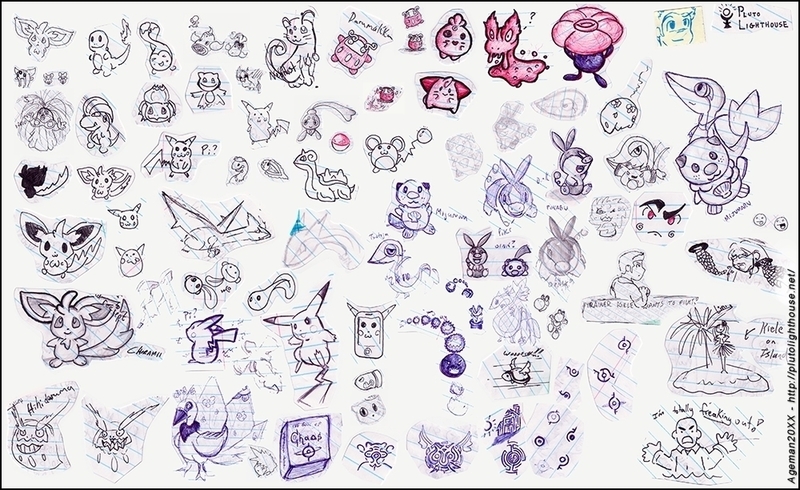 This often meant lots of video game fanart along the margins of my notebooks and scrap pieces of paper. It's been now been several months since left my position at that company, and in a move similar to when I left my position at Virgin Mobile (see "Pokemon Doodle Collection") I decided to cut-out and piece together all the random doodles, scribbles, and other sketches from my notebooks into one big collage to post here.